Hepatitis C is a Ribonucleic Acid (RNA) virus that attacks the liver and can cause fibrosis, cirrhosis and even carcinoma. Not only damaging the liver, hep C can also cause damage to other parts of the body, including the kidneys, joints, skin and may cause blood issues. There are about 170 million people worldwide who are infected with HCV (hepatitis C Virus), and the most common infection comes from exposure to blood that contains the virus. Many people who test positive for hep C have no idea how they contracted the virus and deny all risk factors for exposure. Of those exposed, up to 85% will develop a chronic infection. 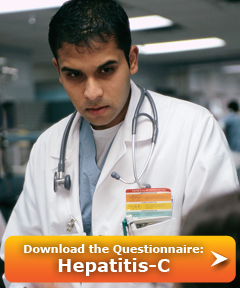 Among those who are chronically infected w/ hep C, after 10-20 years, about 20% will develop cirrhosis. The risk assessment for hep C varies according to factors such as the time frame since the person was exposed, the lab testing—specifically liver function tests, whether a biopsy was performed, alcohol or drug use, and response to treatment. A detailed history is helpful and allows us to give the best possible idea of potential offer from the carriers. Age or date of diagnosis? Is there a known cause? What are the latest Liver Function Test Readings? Specifically ALT, AST and GGTP? If there’s been a biopsy, what is the Fibrosis stage? How is it being treated? Any interferon or ribavirin treatment? How frequently is there follow up with a physician? Current alcohol consumption? Type, quantity and frequency? With appropriate treatment, hepatitis C infection can be cured. Typically, treatment is going to be recommended for patients w/ more than 6 months of elevated liver function tests and RNA levels. The most common form of treatment is with interferon, which is injected and/or oral ribavirin. The response to treatment depends upon a number of factors, some of which include the extent of fibrosis seen on biopsy, the amount of hep c virus detected in the blood, and which of the six known genotypes of hep C that the applicant has. Underwriting for hep C can be very involved and typically we’re looking at a minimum of a Table 4-6, although Standard approvals are possible in a very select few number of cases that demonstrate ideal scenarios. This is a big improvement over past history, where diagnosis of hep C was usually an auto-decline. Give us a call or submit the questionnaire and let us help you assess your hep C case and give you a realistic idea of what to expect from underwriting. As always, we're here to help you answer questions, and provide the best underwriting services possible to help you place more cases.